Lots of home-based businesses will keep you working away from home just as much as any full-time job, but if you start one of these small businesses, you’ll be able to actually work at home rather than just using it as your base. The advantages of working at home are obvious to anyone, but as a parent, they’re especially compelling. If you have to work, being able to work at home makes it possible for you to be there for your kids. Unfortunately, few workplaces offer full-time telecommuting, so if you want to be a stay-at-home parent, starting a business of your own is your best option. Note that these are in no particular order and that many of them require you to have a specific skill set as well as the ability to work for yourself rather than someone else. Technical businesses – App developers, web designers, social media managers, graphics designers, printers – there are many technical businesses that can be run from your home rather than your office, thanks to today’s wired world. Professional businesses – Notary public, travel agent, aesthetician, hairdresser, massage therapist, bookkeeper, business coaches, writers, travel agents; surely, you can think of another profession to add to this list. If your profession involves meeting with clients in your home, you’ll want to read these tips for making your home business as client-friendly as possible. 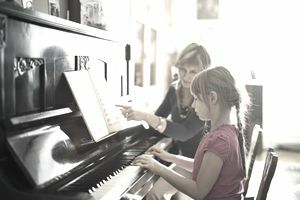 Teaching – Piano teachers are traditionally home-based, as are instructors of many other musical instruments. Not musically trained? What about tutoring? Math and English tutors are particularly in demand. Sports instructor – If you have a house with a layout that allows you to have a designated studio, (and the skills) becoming a yoga, Pilates, or martial arts instructor might be a great home based business idea for you. Making and repairing – Many successful repair businesses are run out of people’s homes, from small engine repair and car repair through repairing shoes or tennis rackets. Tailoring and alterations – Are you a talented seamstress? People who can do tailoring and alterations are always in demand. And if your talents also run to design, you might be able to combine this with creating and selling your own fashions. Crafts and arts businesses – Almost every type of artist can sell their creations online through their own website or through sites such as eBay and Etsy and you may be able to sell from your own home studio as well. Giving classes on your specialty is also possible. Many people are interested in learning how to paint, create objects out of stained glass, or make jewelry, for example. And then there are the host of artisanal businesses that require talent and a well-equipped shop, such as welding, furniture making, woodworking and cabinet making. For animal lovers - Animal boarding and animal treat bakeries work well as home-based businesses. Veterinarians can work out of their homes, too. Both running a veterinary operation and boarding animals will require having appropriate facilities that are separated sufficiently from your family’s living space. Bed and breakfast (B&B) – If you’re in an area that people want to visit, this can be a great work at home option, as it can involve the whole family in one way or another. Farming – The quintessential work-at-home business is still possible and becoming increasingly popular as interest in locally grown food increases. Like the B&B, this is a lifestyle as well as a business choice that will involve the whole family. These are just a few of the home businesses we've seen! Note that having a retail store on your premises will only work if your location is conveniently accessible to the general public (and of course, if zoning allows it where you live)—unless you are starting a retail business that is entirely web-based. When you’re choosing a home-based business of any kind, make sure you research all the rules and regulations that may apply to your idea. For instance, there are no human food-based businesses on this list, because such businesses require a government inspected kitchen, which is not possible in many homes. Your business idea also has to conform to the municipal laws such as zoning, which may prohibit home businesses entirely or of some types, such as those that would involve customers or clients visiting you in your home. And, like any other business, your new business will need to be properly set up and licensed. Ready to work at home? Pick one of the home based business ideas above and get started.